Work has started to clear the road at Gardenstown. Work has begun to clear the latest landslip affecting a tiny north-east community. Heavy rain two weeks ago led to mud and other debris tumbling down a hillside and into a temporary wall designed to protect Gardenstown’s Harbour Road. Efforts to clear the route, which connects the top of the village with the bottom, started yesterday with the removal of giant hay bales which were being used to protect nearby homes. Andy Sturdy, secretary of Gardenstown village action committee, has welcomed the move and hopes residents can drive along Harbour Road again soon. Mr Sturdy said: “It is a positive to take that they are at least restarting. “It is going to take at least this week to get back to where we were several weeks ago. “They are starting work to clear and they are also, as I understand it, potentially starting work on the permanent solution. 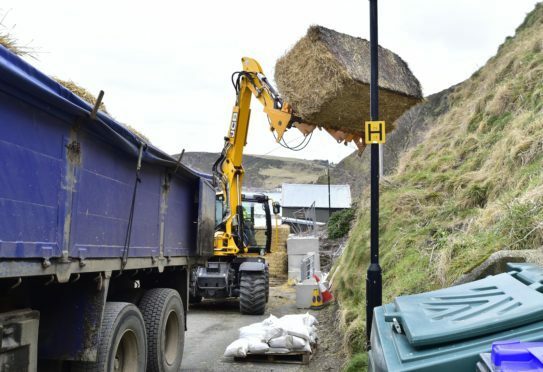 “The big bales of straw are being taken away and then the mud and blocks so the road could be potentially partially reopen by the end of the week. Mr Sturdy said villagers are keen for their vehicle access to be fully restored before the Easter break. He said: “We just want it sorted and it is dragging on. We still don’t know any time scales. “Everybody wants it to be open by Easter and that is now less than two weeks away but to what extent it’ll be open by then I have no idea at the moment. “The holiday lets are being badly affected already because the word is around that there are problems. It is understood efforts to clear the mud and rebuild the temporary wall will begin today. Last week council leader Jim Gifford said the local authority may need to turn to the Scottish Government for financial support to pay for a permanent fix at Gardenstown. It came as Aberdeenshire Council approved a £1.5million package to permanently fix the crumbling cliff face, which has blighted residents since December. Contractors Atkins Ltd has said that a soil nailing procedure could be the best option going forward. This involves installing steel bars to support unstable slopes, which would require further road closures to allow the works to be carried out.